Since it launched last summer, new 3D online casino WinADay.com has been eagerly anticipating its first big progressive jackpot winner and it happened last week. An Italian player known as Monica68 won €116,200 ($148,724) while playing Wheeler Dealer, one of the five unique slot machines at the three dimensional casino site. This is the first progressive jackpot win at the new site. It was reset to $30,000 and has been increasing steadily ever since. If it’s anything like the jackpot at WinADay’s sister site, Slotland.com, it won’t be long before another player is celebrating a six-figure win. The second they arrive at the site, the WinADay.com experience is a totally new one for online casino players. Greeted at the door by the animated casino concierge, they are ushered into the main casino lobby where casino service staff help players choose between the five absolutely unique slots and video poker games waiting for them there. WinADay.com games are based on the latest instant-play, no-download Flash technology that allows designers to incorporate the rich media content that today’s online game players expect. There’s nothing for players to download or install – they are in the 3D casino lobby, ready to play, in seconds. All games are original, built using proprietary software, and only available at WinADay.com. All games are tied to one progressive jackpot pool. 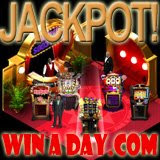 WinADay.com has made good on its promise to continually add new games and has added two new slot machines, Heavenly Reels and Gold Boom, since launching. Heavenly Reels is a four pay line slot adorned with heavenly cherubs and with angel wings that appeals to strategic slots players since, after checking the results of the first spin, players can hold any or all of the reels on their second spin. With symbols that hearken back to gold rush days, Gold Boom is a 9-wheel, 6-pay line slot machine that offers free bonus spins and awesome payouts. A sixth game is expected within weeks.